To learn more about our general conditions of sale , please read our terms . 1.1 This document defines the conditions governing the use of this Web page and product purchases herein (hereinafter the “Conditions”). 1.2 The Conditions should be read carefully prior to using this Web page. 1.3 By using this Web page or placing an order through it, the Customer is consenting to being bound by these Conditions. 1.4 Where customers do not agree with all conditions this Web page should not be used. 1.5 These Conditions may be amended at any time. 1.6 It is the Customer’s responsibility to read these conditions periodically, as the Conditions prevailing at the time of use of the Web page or conclusion of the Contract (as defined below) are those that shall apply. 2.1 This Web page runs under the name Pedemeia and is the property of the Portuguese company AJ GONÇALVES, SA, NIPC/TIN 500 002 606, having registered offices at Avenida Covedelo no. 28, Parish of Celeirós, 4705-400 Braga (Portugal). 3.2 By using this Web page, the Customer consents to the processing of the information and data provided and declare that all information or data provided to us is true and accurate. a) Use this Web page solely to make legally valid inquiries or orders. b) Not place any false or fraudulent order, whereby, where there are suspicions that an order of this nature has been placed, we shall be authorised to cancel it and report it to the relevant authorities. d) Provide us with a genuine and accurate email address, postal address and/or other contact details. e) When placing an order by means of this Web page, the Customer declares that he/she is over 18 years of age and has the legal capacity to enter into contracts. 5.1 All information contained in these Conditions and the details included on this Web page do not constitute an offer to sell, but rather an invitation to enter into a contract. 5.2 No contract shall exist between us and the Customer in relation to any product until such time as the Customer's order has been expressly accepted by us. 5.3 If the Customer’s offer is not accepted and their account has already been charged, the respective amount shall be refunded in full. 5.4 In order to place an order, you should read and comply with the provisions of the following section. 5.5 Completion of the entire procedure laid down in the Instructions for Use does not mean that the order has been accepted, since it constitutes a proposal to buy one or more goods that the customer makes to us. 5.6 All orders are subject to acceptance by us. 6.1 In order to make purchases on our Site, you are required to sign up. After that, you will be required to log in. 6.2 In order to place goods in the shopping cart, simply choose the product, colour, size and click on the add to cart button. 6.3 When you have finished selecting all the goods you require, go to the shopping cart and follow the steps to choose the place of delivery/collection, payment method and finalise your order. 6.4 You will receive an email with confirmation of the order and the payment details. 6.5 You will be informed by email regarding changes in the status of your order. 6.6 You may also check the status of your order in the customer area. 6.7 AJ Gonçalves, SA reserves the right to set a maximum number of items per customer. 6.8 The photos shown may not match the features described. 7.1 The orders for goods presented on this Web page are subject to availability. 7.2 If any difficulties occur with the supply of goods, or if items are not in stock, we reserve the right to provide information regarding substitute goods, of equal or higher quality, that the customer may order. 7.3 Should you not wish to order any substitute goods, we shall refund the amount paid. 7.4 We reserve the right to withdraw any goods from this Web page at any time and to remove or modify any material or contents thereof. 8.1 Notwithstanding the preceding Section, with regard to the availability of goods, and unless there are extraordinary circumstances, we shall endeavour to ship the goods ordered within 15 days of the date of Order Confirmation. 8.2 If, for any reason, we cannot deliver by the delivery date, we shall inform you of this fact and we shall offer you the opportunity to continue with your purchases, establishing a new delivery date, or to cancel the order, receiving a full refund of the amount paid. 8.3 For the purposes of these Conditions, the “delivery” shall be considered concluded or the order delivered upon signing of the delivery note at the agreed address. 8.4 The customer shall be liable for the goods with effect from the time of delivery. 8.5 The customer shall take ownership of the goods when we receive full payment of the amounts due in relation thereto, including delivery charges, or upon delivery (in accordance with the definition contained in Section 8.3 above), whichever is later. 9.1 The price of each product shall be that which is stipulated, at all times, on our Web page, except in cases of obvious error. 9.2 If we discover an error in the price of any of the goods that a Customer has ordered, the Customer shall be informed as soon as possible and the option shall be given of reconfirming the order at the correct price or cancelling it. 9.3 In the case mentioned in the preceding section, if we cannot contact the Customer, the order shall be cancelled and the Customer refunded the amount paid in full. 9.4 We shall not be obliged to supply the Customer with any product at a price less than the correct price if the error in the price is obvious and unmistakable and could have reasonably been recognised by the customer as being an incorrect price. 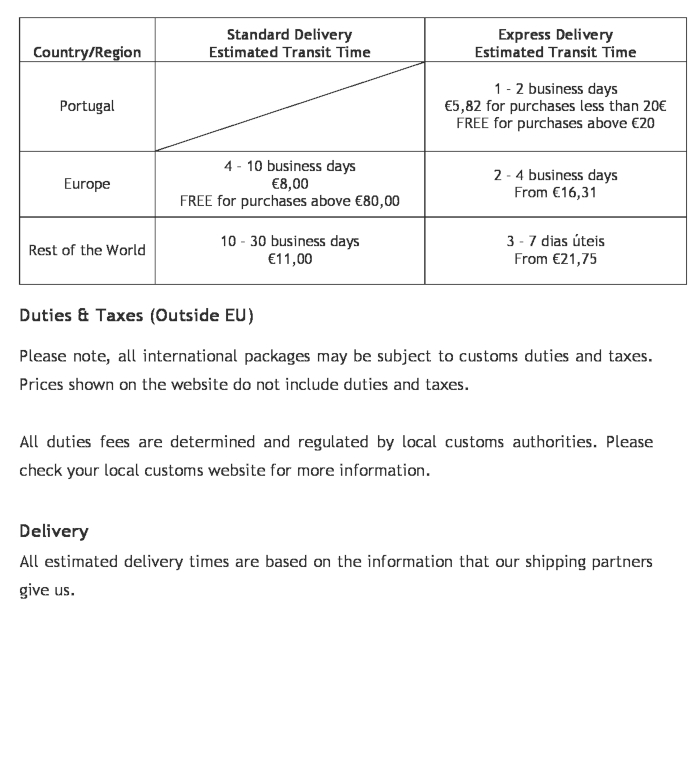 9.5 The prices on this Web page include VAT but exclude shipping costs for purchases, which shall be added to the total amount due, in accordance with our Shipping Costs Guide. 9.6 Prices may be subject to change at any time, but any possible changes shall not affect orders already accepted by us. 9.8 We use technological means to ensure that the payment is made securely. 9.9 Credit cards are subject to verification and authorisation by the relevant issuer, but if the aforementioned entity does not authorise the payment, we shall not be liable for any delay or non-delivery, and we cannot formalise any Contract with the Customer. 9.10 The customer must make payment within a maximum period of five days; otherwise the order shall be cancelled. 9.11 Expenses relating to customs duties, if any, shall be borne by the customer. According to the applicable regulations, where the customer is acting as a consumer, he or she may withdraw from the Contract at any time within 14 days of the delivery date of the order, for the purpose proceeding to return the items. In addition to the legally recognised right to a cooling-off period granted to consumers and users, as mentioned in Section 10.1 above, we offer the Customer a period of 30 days from the date of Order Confirmation in which to return the goods. The customer is entitled to return the delivered goods if it appears that these are defective or do not conform to the goods ordered, in which case the goods may be returned within 30 days from the delivery date of the order. 10.4.1 Within 30 days of the delivery date of the order the customer may request that the articles received should be exchanged for others, or for different sizes of the items ordered. 10.4.2 The exchange may be made by returning the goods, or directly at “Pedemeia” stores. 10.4.3 In the case of return, the Customer shall be refunded the amount paid for the returned goods. 10.4.4 The costs incurred in returning defective goods, or those received by the customer that do not conform with the goods ordered, shall be borne by us. 10.4.5 The costs associated with returns that may occur for reasons other than those referred to in the preceding section shall be borne by the customer, and shall be non-refundable. 11.1 Our liability in relation to any product purchased on our Web page shall be limited, strictly, to the purchase price of that product. 11.2 Given the open nature of this Web page and the possibility of errors occurring in the storage and transmission of digital information, we do not guarantee the accuracy and security of the information transmitted or obtained through this Web page, unless explicitly stated otherwise. 11.3 All product descriptions, information and materials contained on this Web page are provided as true and without explicit or implied warranties relating thereto. To the extent permitted by law, we exclude all warranties, except those which cannot lawfully be excluded in relation to consumers and users. 11.4 The provisions of this section do not affect your statutory rights as a consumer and user, nor your right to withdraw from the Contract. 12.1 For further information, you may contact us via email using the address sales@ajgoncalves.pt or by telephone using the following number: +351 253 672 181. 13.1 We reserve the right to revise and amend these Conditions at any time. 13.2 The customer is subject to the policies and Conditions in force at the time of use of this Web page or when an order is placed, except where, by law or decision of government agencies, we are obliged to make changes retrospectively to these policies, Conditions or Privacy Statement; in this case, these possible amendments shall likewise affect the orders that the customer has placed previously. 14.1 The customer acknowledges and agrees that all copyrights, trademarks and other intellectual property rights relating to the materials or content provided as part of the Web page are, at all times, ours or belong to those who granted us a licence to use them. 14.2 The customer may only use this material as explicitly authorised by us or by those who granted us a licence to use them. 15.1 These general conditions and all disputes relating to these general conditions, including their validity, the use of the site or any purchase made by means of the site, shall be governed by Portuguese law. The shipping value does not change, regardless of the order value.